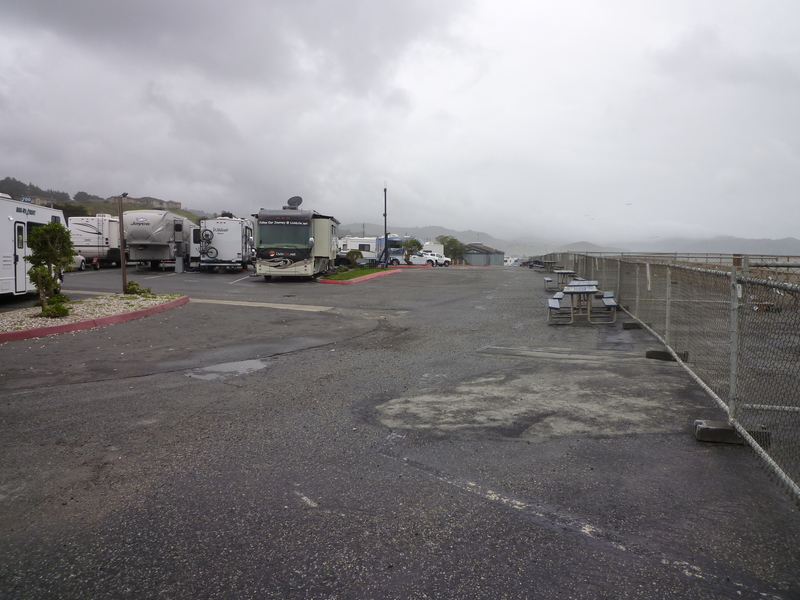 Ok this campground is close to San Francisco and from the brochures one is able to go downtown with public services. However don't stay on this park to get a sun tan or something like that as there is hardly any place to do that (unless you want to sit in the middle of the street). You get only a parking lot (with no strip next to it to sit on it). The wifi doesn't work (yes, you can get a good connection in the office). Even the buy-4-one-day version is not stable. The price (incl tax) is high because of the groundprices, but this is a price I've not yet come accross. Lowered the number of stars because of the price. This park is really a very tightly spaced parking lot, with no room for a tow vehicle. For as expensive as it is you would hope for more room. It has a very creepy vibe, a section of long term spaces full of vehicles that do not look roadworthy and rough looking people, a swimming pool where that is not inviting that people from the neighborhood use. The park is on the ocean, but you are so high on the bluff that all you see is grey ocean with no access to the beach. A large section of the parking area has fallen into the ocean and the only spaces along there are very short with no hook-ups. It was foggy every morning we were there until perhaps 11, a strong on shore breeze brings a salty brine that coats your rig, even the best fittings start to corrode and rust. The problem is there are not many choices in the Bay area. Front row, what a view!!! The hostesses were great. Very pleasant and VERY helpful.The view, if you are in the front row is awesome!!! They even allow you to back in even with the hook ups on the wrong side. Was disappointed in that it is an Encore resort with the campers that that do allow... Some in very poor shape. Wie booked the place thruh the internet, as we liked the pictures on the website. But the truth looks different and the showers/restrooms are horrible. But it's close to San Francisco and it has a nice view. Go to sleep to the rhythm of the surf and wake up with a view of the Pacific. No trees...just spectacular views. See whales, pelicans and dolphins from your RV. Shopping and transit close by. The "city" less than a half hour away. What more could you ask for?